Useful for Home, Office, Jewelers, Financial Institutions, Banks & Commercial Users. Lock Type Electronic Lock. 100% Made in India. Size, Colour, Internal Design, Electronic Technology can be Customized. One of the oldest manufacturers in India. We, MAHARASHTRA FURNITURE, started operations in 1955 and established this name in 1976 in this economic capital city of the country–“Mumbai”. Shree Babulal Thakershi Tank, founder of the company started manufacturing MS cupboards with his own hands and now his second and third generation (Rajesh & Rahul Tank) are successfully running the business with utmost excellence, keeping in mind the generations gifted business advice that “Quality things have no fear of Time”. With head office in Mumbai, we have reach all over country through supply channels. More than 60 years of experience and new brand name “TRIVETA”, we have made ourselves capable to cater standard and customize needs of safe security solutions & furniture for home, banks, commercial or corporate offices, manufacturing industry, institutions, schools & colleges. With a team of dedicated manpower, interior designer and par with today’s technology, we are constantly working on manufacturing of safes lockers, security solutions & innovative MS furniture. 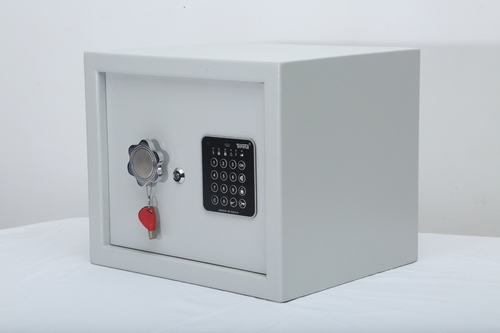 From manufacturing basic safe’s for home & office to variety of electronic, mechanical, fire retardant safes, vaults, strong room doors for banks, corporate offices and institutions; ‘MS store-well cupboards’ for office to sophisticated ‘office modular units’; basic home use ‘cupboards’ to ‘designer custom make wardrobes’, we manufacturer, supply and retail all kinds of safe security solutions & MS furniture. We provide variety of safe (tijori), furniture product for home, corporate office, banks, manufacturing industries, institutions, schools & colleges and institutional use under one roof. We also provide services like home space designing, commercial space designing, industrial space designing & interior designing as per individual or corporate needs. We have in-house interior designer so that we can advise and provide what exactly the customer needs.